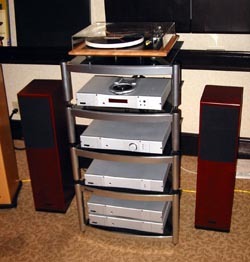 Emotive Audio and SAP (Strumenti Acustici di Precisione) were partnered again for the second time in 2002, with the Emotive Audio Sira pre-amplifier (price has gone up since our review last year to $7,000), the brand new Caeli 300B monoblocks ($17,000 USD), and the SAP Quartette loudspeakers ($10,000). 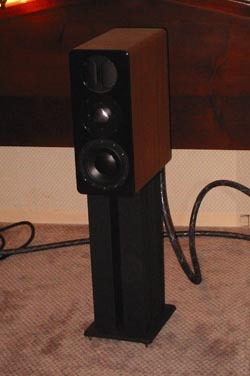 I first heard the Quartette at the Top Audio/Video Show in Milan in September 2000, and they were without question the best speakers at that particular show with a superb sense of scale, a beautiful degree of warmth in the midrange, and a lot of inner detail. The Caeli are a dramatic new product from Fred Volz, and we have been promised the first review pair. Cliffhanger Audio demonstrated their Bulldog monitors ($3,699... although they have better bass extension than most three and four-way floorstanders) this year in a system using a pair of Jolida monoblocks, and once again they lived up to their name. The bass response of these monitors is outstanding, as is its sweet midrange and airy treble. 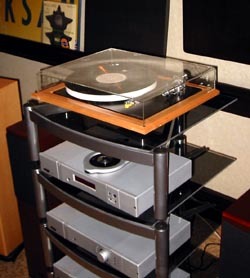 What is the deal with these small stands? British loudspeaker manufacturer, Harbeth, had speakers playing in a number of rooms at this year's show, and the most impressive by far was the Monitor 40 reviewed by us last year. The only complaint that we can make about the sound is that speakers need to be higher off of the ground. 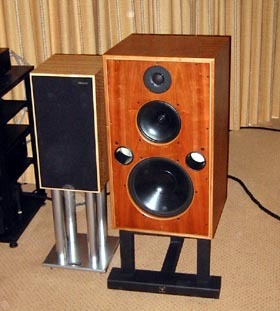 There is a dramatic change in the expansiveness of the sound when these speakers are raised additional eight or nine inches from the ground and we would love to hear this speaker again in the near future. 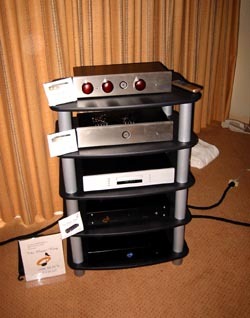 We went looking for a pair of Spendor SP100s or SP1/2s (reviewed by us in March 2002) at the show, but we had to settle for the new S6 and S8 models that were very impressive in both the Rogue Audio and Hovland rooms. In the Rogue Audio room there was a pair of the S6 was being driven by the Rogue Audio M-120 Magnum monoblocks. It sounded very smooth with both rock and jazz recordings. 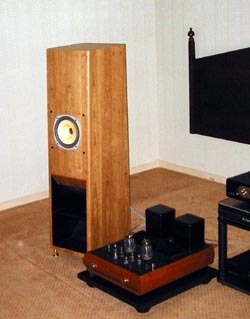 The new "S" series have far greater low-end extension than the "Classic" series, but they also sound slightly closed in. The "S" series models also require more power to come alive. 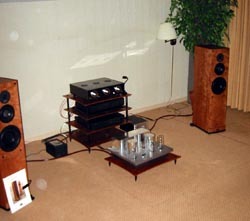 In the second room, a pair of S8 was being driven with a Hovland power amp and controlled by the stunning Hovland HP-100 pre-amplifier. Yeah, but can she cook? Blue Circle Audio's President and Head Designer, Gilbert Yeung, is known to have a slightly dry sense of humor, but it would appear that his better half is clearly influencing his thinking in a very interesting new way. "The Pumps" (available at www.classicpumps.com) are not a Blue Circle product, but the 25-watt amplifiers inside the ruby red pumps are without question the most original high-end product in years. Not only do they work (they even come with their own cables), but also they don't sound bad at all. Of course, what would a pair of amps be without a comparable pre-amplifier? 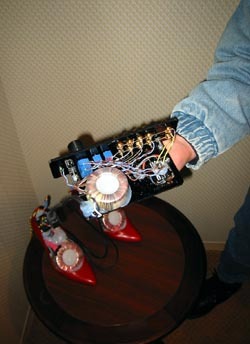 The "Purse" is a fully functioning solid-state pre-amplifier with matching purse and shoulder strap. 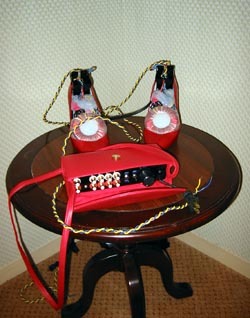 The amplifiers are $799 per pair, and the purse is $599. On a more serious note, Blue Circle also introduced a new amplifier, pre-amplifier, and series of balanced power conditioners. The CS series of electronics includes the CS power amplifier ($1,095, 85 watts/channel), the CS pre-amplifier ($795, 3 inputs, optional processor bypass loop), and the CS integrated amplifier ($1,150, 50 watts/channel, 3 inputs). 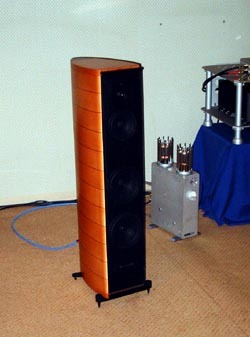 The CS power amplifier was very impressive driving a pair of both Opera and Harbeth loudspeakers. Blue Circle also introduced its Music Ring series of balanced power line conditioners. Starting at only $699 with its MR800 model, Blue Circle is clearly going after this very competitive segment of the market with both guns blazing. 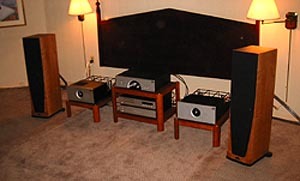 Tenor Audio and RL Acoustique were once again one of the obvious stars of the show with the Tenor Audio 15 watt OTL amplifiers and the Lamhorn 1.8i ($6,000 with the AER drivers) loudspeakers. The Lamhorn 1.8i (in a stunning natural cherry) were totally free of the Lowther "shout" and crystal clear through the midrange and treble. The Lamhorn 1.8i produced my favorite personal moment of the show, as the room completely emptied during a demonstration of the loudspeaker using Radiohead's latest release, Amnesiac. We still can't figure out why people left, as the sound was superb. 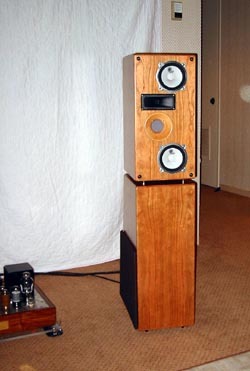 Bravo to RL Acoustique for such a wonderful loudspeaker! The brand new Sonus Faber Cremona loudspeaker ($7,495) made its debut in Montreal, driven by a complete set of electronics from Nagra, and the room was consistently jammed throughout the show. The Italian manufacturer continues to produce the most visually appealing products in the market and the sound isn't far behind. Viva Italia! Turntables were in short supply in Montreal, but that didn't stop Rega from showing off its flagship P9 turntable, along with the Jupiter 2000 CD player, and the entire line of Rega loudspeakers. The Jupiter 2000, in particular, was very impressive for the price that is just under $2,000.